This is what the Greater Manchester Police did to peaceful Legal Observer Kris today. He is in hospital in a wheelchair – visitors this evening concerned about his welfare were physically ejected and threatened with arrest. Please share this widely, complain to the GMP and add any links on the original photo thread to other means to complain, or otherwise do something about this abomination. 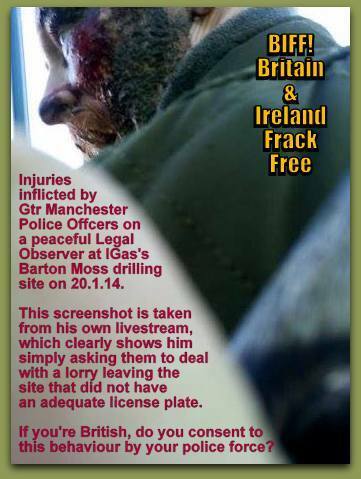 This entry was posted in Campaigns, National News and tagged al jazeera tv, Barton Moss, Barton Moss Protection Camp, Greater Manchester Police violence against Fracking protesters, Igas, police violence by tamesidegreens. Bookmark the permalink.